I never quite caught on to the allure of bagels. I’ve always been more partial to regular toast, not too thick or thin, and plenty of surface area for smears of peanut butter and jam if I’m going sweet, or avocado if I’m going savory. I also blame my Midwest roots for never having a proper New York doughy, yeasty bagel that they say life-blood in food form. And the fact that I couldn’t access gluten-free versions up until just a few years ago. 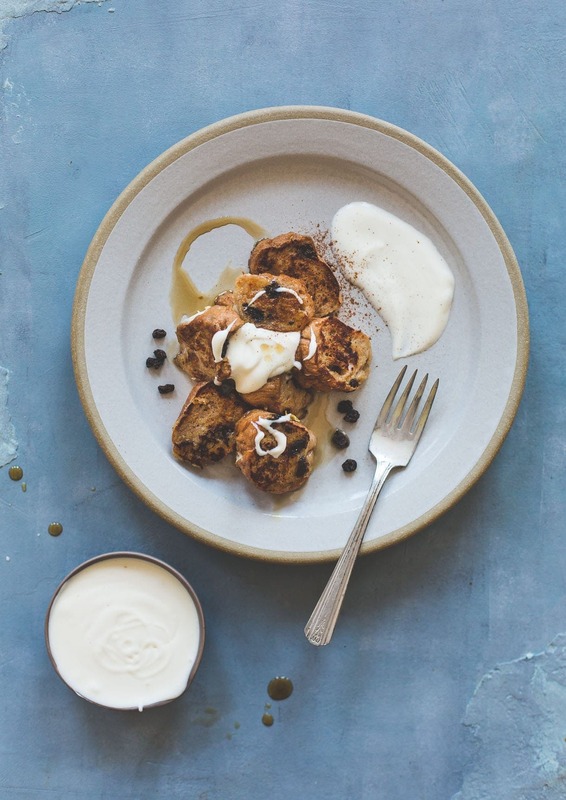 But this bagel french toast …….. I’m 110% behind. Sliced on the diagonal, dipped in a vanilla milk bath, and griddled into mini french toasts. Not only a different way of doing things, but definitely the closest thing to a damn good gluten-free cinnamon roll that I’ve ever tasted. 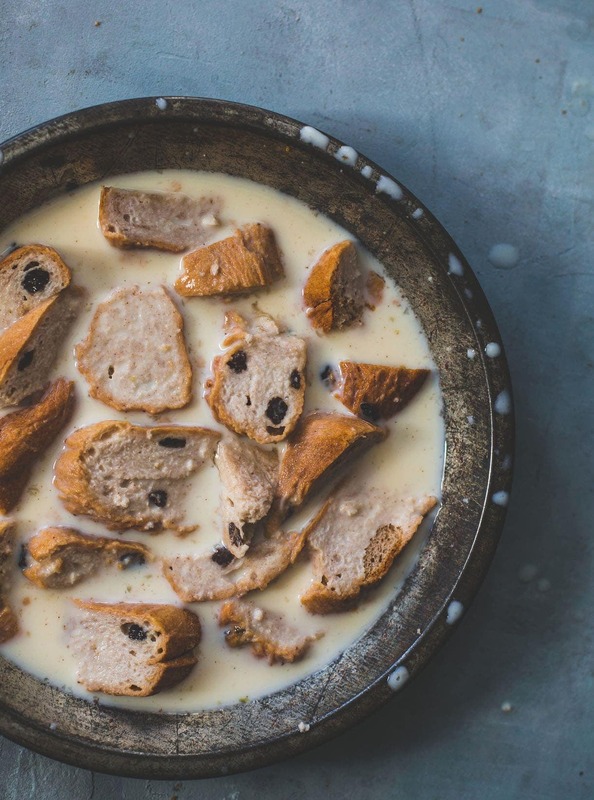 The combination of sweet, cinnamon raisin studded bagel slices + mild, creamy creme fraiche is a brunch marriage, the kind that’s destined to stay together forever. Another advantage to using to using bagels (my go-to brand and partner is Udi’s Gluten-Free) instead of bread was how they soaked up the milk. In the past I’ve had issues with bread getting a little soggy, and more eggy than I’d like. But the sturdy characteristic of a bagel means it soaks on the outside so the surface can caramelize in the pan, and the inside stays soft and bready. Yes, like the interior layers of a cinnamon roll….. the best part. I didn’t sweeten the crème fraîche because I thought it offered the perfect cool and creamy counter to the warmly spiced bread. And it left room for a drizzle of maple syrup, a must in my books for french toast. Because it’s a little more indulgent, I totally get your thinking of “this is a weekend recipe”. But on the contrary, it took me less time to make than my weekday bowl of oatmeal. Knowing that, it’d be a great option if you’re hosting brunch. Quick, easy, and semi-homemade. Have a safe and happy holiday-esque rest of the week. And maybe this for Christmas morning breakfast. 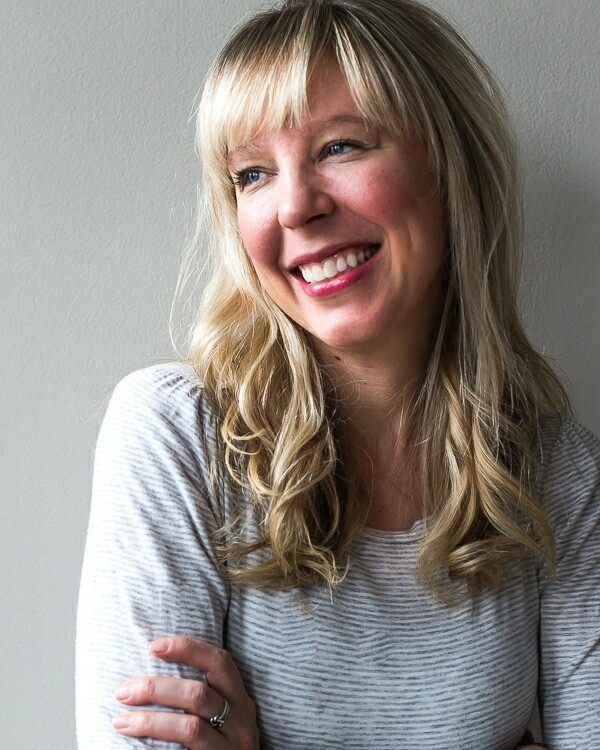 This is a sponsored conversation written by me on behalf of Udi’s Gluten Free. The opinions and text are all mine, and I’m happy to be a continued partner of Udi’s. 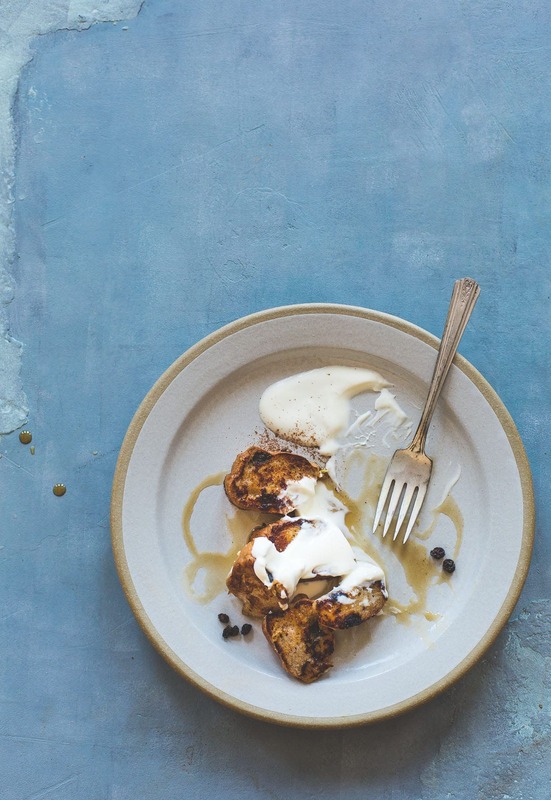 side note: This recipe came about because I was recently jealous of cinnamon raisin french toast that Brian ordered when we were in Michigan last month. On a whim, I decided to use the gf cinnamon raisin bagels because I didn’t have any bread. After I had created the recipe, I noticed others have done something similar, most notably, Molly Yeh and this blueberry version from Yammie’s Noshery. In a shallow pan, whisk together egg, milk, maple syrup, cinnamon and vanilla. Dunk the bagel pieces in, letting them float for 30 seconds, then flipping them over, and spooning the liquid over. Then let them sit for 1 minute, and remove, setting on a plate. Melt 1 tablespoon butter on a griddle or in a cast iron skillet. Bring to medium heat, and add some of the bagel slices. You'll be doing this in a few batches. Cook on one side for 3 minutes, then flip and cook for another 2 or 3 minutes, until golden brown. Remove and put foil over to keep warm while you finish the others. Before adding bagel slices for each batch, melt 1 tablespoon butter, and proceed. Serve with dollops of creme fraiche and maple syrup. I feel you on the lack of good bagel options in the Midwest but I still love them (even if they aren’t anything like the NYC ones). Both french toast and bagels are my two favorite breakfast foods (carb obsessed, always) so I LOVE this! 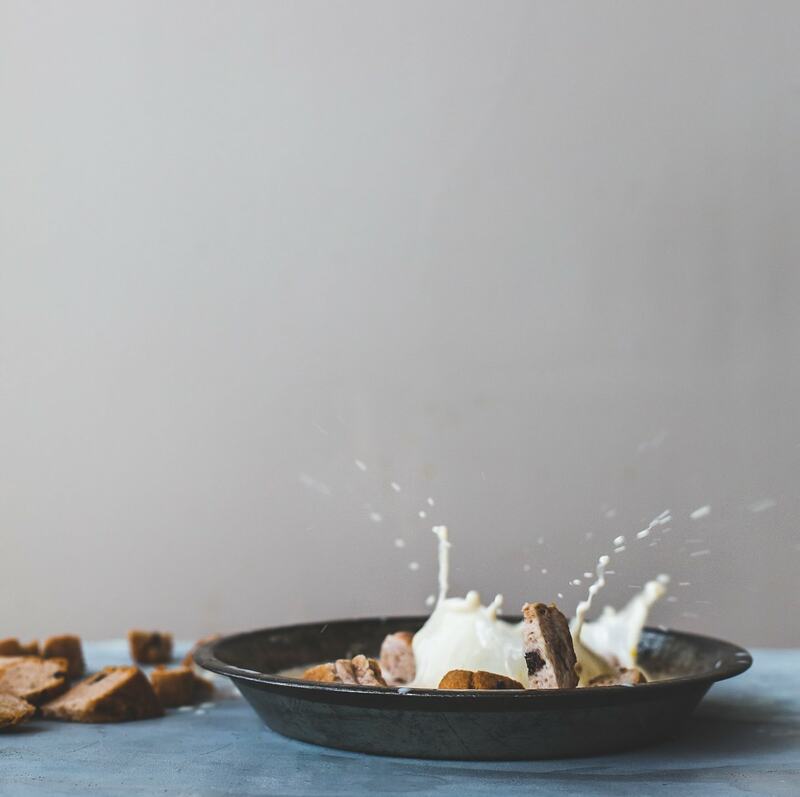 Also, that action shot with the milk is so so so good! whoaa bagel french toast! I’ve never been much of a bagel person either, and when I went to college in STL and became more introduced to non-Asian foods, you’re right – there’s not too much of a bagel scene in the midwest. I do love bagels in NY and Montreal, but I can’t get over t he fact that it’s so dense! HOWEVER. As a french toast that sounds AMAZING. That texture + the custard coating. Insanely genius Amanda. My Goodness.. 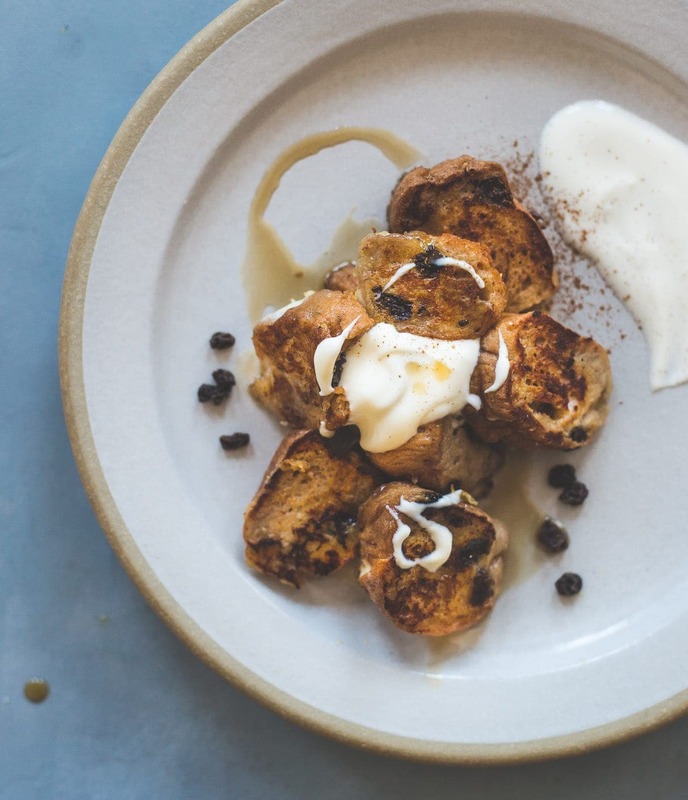 I am not a big bagel person either, but bagel French toast looks amazing. 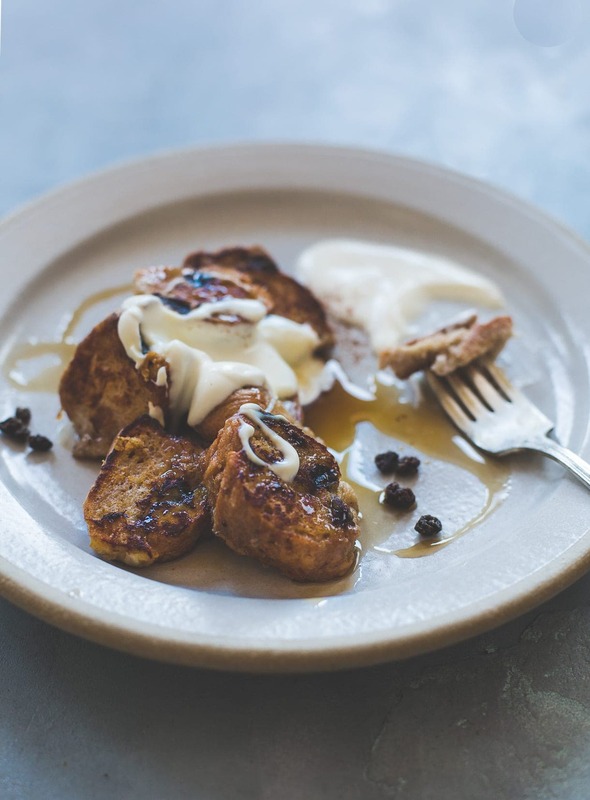 I think creme fraiche is a life changing ingredient and I can only imagine how delicious this French toast with a big dollop of creme fraiche. the funniest thing about that photo — two days later i was in the same room and went to plug something into the wall. and realized it had a nice coating of milk splatter. lol! Amanda, this sounds so GOOOOOOOD. And I’m all about making every weekday feel more indulgent, and I’m more than willing to pay any price for that. ;-) I hope you had a great Christmas! !